As the project draws to a close, we have created a short presentation to summarise the benefits the project had on our school. Mrs Averill and Mrs Dunne attended a transnational meeting in Madrid. The purpose of this meeting was to complete final reports on our Erasmus+ project, as our two year project is now drawing to a close. Meetings were held in Colegio Jaby, Madrid. The coordinators from all partner schools attended. Mrs Averill attended as project coordinator for St. Sylvester's, and Mrs Dunne as acting coordinator (as Mrs Kelly is on maternity leave). They had a lovely time and were sad to say goodbye to the friends we have made over the last two years. We plan to keep in touch with them, and hope to work with some of them again in a future Erasmus+ project. Together we created a number of Final Products to conclude our project. We created a short video to share some of the memories we have of the project. Our Spanish and Turkish partners compiled this with photographs taken by all the countries. We have published a common website to summarise our project. Our Finnish partners created the website and all partner schools contributed towards it. Our Turkish partners also created a lovely e-magazine to summarise the first half of our project. All partner schools contributed to the magazine. Mrs Dunne, Ms Mullaney, and Mrs Averill went on a great trip to Turkey. They sent an email home to the pupils. We are having a great time here in Turkey. The weather is warm and sunny. We are staying in a beautiful town called Foca. It reminds us of Malahide a little bit, because it is beside the sea and has lots of lovely restaurants. Yesterday we visited our partner school in Foca for the first time. We were welcomed by lots of children waving flags and by some great dancing. Then we were brought on a tour of the school. We started in the kindergarten which is the class for the youngest children. They are aged four years old. We joined in some songs and dances. Then we went to the older classes. We saw lots of children working with iPads. The children were mostly using coding apps. We had seen some of these before (Bee Bot and Scratch Junior) but we also saw some new ones to give us some ideas for when we come back home. We also saw the children using apps to teach them about patterns in maths. In this school every child has an iPad and they bring it to school to use for iPad time once a week. The children really enjoy this time and couldn’t wait to show us their favourite apps. This boy taught us all about Lego Robotics and a drawing app called Quiver. We really enjoyed looking around the beautiful school. We liked the Oku sign which means “Read” and is a mini-library. We also enjoyed seeing the Erasmus+ corner. Can you spot the Ireland flag? In the afternoon we were brought on a beautiful boat trip. We saw beautiful rocks that were formed by lava many many years ago to create small islands. Some legends say that mermaids live in the sea beside these islands. We ate a delicious dinner of barbeque fish on the boat. Then we watched the sunset. It was really beautiful. Today we had a busy day. We went to meet the District Governors and Mayor. They are the people in charge of schools in Foca. We had our photos taken a lot of times with all the people we met! Later we went back to the school to take part in an art class. We learned about the traditional art form of Turkish marbling. We went to dinner in the evening and ate lots of traditional Turkish food. We were so full afterwards! Tomorrow we are getting up very early to visit an ancient city called Ephesus. We will be travelling there while you are still asleep in your beds! There are many stories about Ephesus and some are mentioned in the Bible. We are also visiting a holy church named after Mary because it is believed she lived in this area for a while. We are really looking forward to it. Mrs Dunne, Mrs Averill and Ms Mullaney. Mrs Dunne, Ms Mullaney, and Mrs Averill went on a great trip to Finland. They sent an email home to the pupils. Greetings from a very snowy Finland. We are having so much fun here. This morning the Finnish boys and girls met us at their school. They sang songs and performed dances for us. Then we had a tour of their school. We saw some beautiful artwork. At break time the boys and girls go outside to play every day no matter the weather! There is so so much snow here, much more than we had during Storm Emma, so some of the children ski to school. We also saw lots of the children were ice skating. Miss Mullaney joined in too! We walked back to our hotel in the snow. We had to wear warm coats and snow boots. Later it started to snow heavily and we were collected by car to return to school for a delicious meal. We had moose meatballs followed by ice cream with berries. There was a surprise after dinner when a special visitor who doesn't live too far away popped in to say hello. See can you spot the visitor in the photos! Love Mrs Dunne, Mrs Averill and Ms Mullaney. We arrived on Sunday to lovely sunshine. The school is called Jaby and is in Torrejon which is close to Madrid. The children are aged 3 to 18. There are 600 students in total, both boys and girls. They are very friendly and happy to meet us. They welcomed us with some lovely music. The school is four stories high and has lots of stairs and no lift. Here is a picture of their yard. On Monday we went to Europe Park where the children went on a treasure hunt. We helped them with the clues. Here is a picture of us at Tower Bridge where one of the clues was hidden. It is a medieval town with lots of very old buildings. There is a wonderful festival at the moment and it is very busy. There are loads of decorations and stalls. We are going to see a medieval tournament later this afternoon. We are very excited and can’t wait to tell you all about it when we get back. What a fun and active final day for our guests who joined us for our annual Maths for Fun Day. In the morning, the coordinators from each country had a meeting to review the week and confirm plans made during the week. They joined our junior infants for some active maths fun. The junior infant teachers did a wonderful job setting their classrooms up, each room focusing on a different maths strand. Our guests were only too delighted to play alongside the children. Our guests were presented with their certificates of attendance and a farewell gift during lunch time. Sakine, from Turkey, treated the staff to Turkish coffee with Baklava and some Turkish Delight. Before we said our goodbyes, Ozan from Turkey joined Mr. Brennan and his class to sing Molly Malone. Mrs. Dunne, Mrs. Averill and Mrs. Kelly and our guests went to visit Malahide Community School where they were given a guided tour of the school. Some of the teachers kindly met with our guests to demonstrate the software they use at school and how they use iPads. Our guests then travelled to Dublin for some sight seeing and shopping. They were joined by many of our teachers for some fun on the Viking Splash Tour. Afterwards we had a delicious meal in The Woollen Mills Restaurant. Today our visitors went to visit some of the first classes. They made a presentation to the classes about their home and their schools. They showed them photographs and videos from their schools and taught them a song. The children had questions prepared so that they could learn more about their cultures and traditions. The children then showed them how we use iPads at school. They used maths splat during a maths lesson to explore the hundred square. After lunch, Mrs. Kirby and Ms. Collison brought our guests to visit Pope John Paul 11 school. They visited Ms. Whyte's class and were shown a variety of apps that they use on their iPads. That evening, Mrs. Dunne led our guests and some of our teachers on a walk around Howth Hill. We were blessed with the weather. Afterwards we had a traditional box of fish and chips and walked along the harbour. In the morning, the project co-ordinators from each country had a meeting to monitor how the project is progressing and make plans for the next stage. Our friends from Spain, Turkey, Poland and Finland went to visit some of the senior infant classes. They made a presentation about their countries and showed the children photos of their schools so that they could see how they are similar and how they are different. They also taught them a song. Maryla from Poland told a story about the dragon from Krakow and how a shoemaker defeated it and became the King. Our visitors also participated in a lesson in two of the senior infant classes. The children were using Puppet Pals on the iPads to bring their version of the story Sleeping Beauty to life. They had great fun working with the children. In the evening, our visitors and some of the teachers went for dinner in Bon Appetit in Malahide where they had a delicious meal. The staff really looked after us. Afterwards, they were treated to some wonderful live music in Gibney’s pub. Our guests arrived to the school today from Turkey, Spain, Poland and Finland. 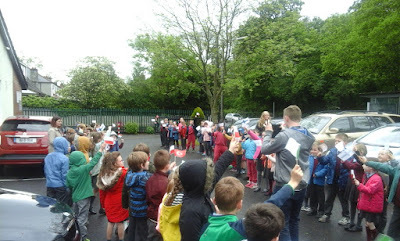 They were welcomed at the gates by the boys and girls from First Class and Senior Infants waving flags. Following this they were treated to a number of performances from different classes in the school hall and they got to witness some wonderful Irish dancing. They then went on a tour of our school and visited many of our classrooms. After lunch they got to take part in Aistear in some of the Junior Infant classrooms. We are really looking forward to some of the teachers from our partner schools. The teachers will be from Finland, Turkey, Spain and Poland. They will visit from 15th to 19th May. When the teachers visit they will observe lessons on iPads in different classrooms. They will also assist in teaching Aistear in the junior infant classrooms, participate in Maths Trails in senior infant and first classes, and teach the children about their home countries. The teachers will also take part in some cultural events around Malahide and Dublin City Centre. We will write up a full report on the visit afterwards. Three teachers from our school (Ms Mullaney, Mrs Kelly, and Ms Kingston) and our principal (Mrs Dunne) recently visited our partner school in Poland. They spent some time learning about "coding" and seeing good practice using iPads in teaching. They went on some cultural events to Krakow and the Salt Mines. They brought Rocaí Rua with them (a puppet we use when teaching the Irish language). The teachers prepared a Prezi to share with the pupils in our school on their return. Hi everyone. Rocaí Rua here. I am visiting a school in Czaslaw in Poland. I hope you don’t miss me too much. I am here with Mrs. Dunne, Ms. Mullaney, Ms. Kingston, and Mrs. Kelly. We are having a really great time. We visited some schools in the area and I have made lots of new friends from Poland, Turkey, Spain and Finland. Here I am making soap with some of my friends from Finland. Our days have been so busy. On Monday we arrived at the school in Czaslaw. The children welcomed us. They sang songs in Polish and performed a traditional dance. It was wonderful. Here is a picture of the children in their traditional costumes. On Tuesday we went to visit Krakow. It is a beautiful city and it was a lovely sunny day. We saw Wawel Castle and I met a fire breathing dragon. I was a little nervous taking this picture but he was very friendly. On Wednesday we went to “Miniature Park”. It was amazing. It is a park full of small versions of famous buildings from around the world. There was a huge slide in the park. Mrs. Dunne kindly took me down the slide as I was a little nervous but she encouraged me to be brave and have a go. I have so many photos to show you from the park but I must go. We are going to visit the Salt Mines shortly. I am very excited. I will show you lots of pictures when I return to school next week. Each partner school held a competition to create a logo for the project. The winner of the St.Sylvester's Infant School competition was Zofia Polanski, from Mr Brennan's first class. Some of the elements of Zofia's logo were combined with some of the winning logos of the other schools to create an overall project logo. 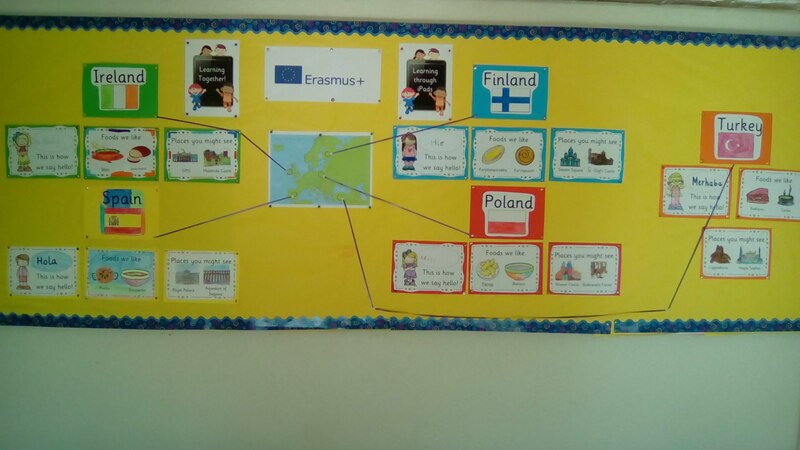 We have begun an Erasmus+ Corner. This is a large display board in our P.E. hall. It has a map of Europe showing the location of our partner schools. It also shows traditional foods, famous landmarks and common sayings from each country. We will add to it as the project progresses. Mrs Averill and Mrs Kelly attended a transnational meeting in Madrid. This was a planning meeting for our new Erasmus+ project which is all about "Teaching and Learning through iPads/Tablets". Mrs Averill and Mrs Kelly are coordinators for the project for St. Sylvester's. They met with the coordinators from the other partner schools to create a time-line for activities for the project. We can't wait to get started!